Trails West has been building the number one horse trailer in the West for over 30 years. Whether you want an entry-level trailer or a top-of-the-line horse trailer with living quarters, we have the perfect options for you. Our priority is to keep you, your family and your horses comfortable and safe as you head to your next great adventure. When you’re looking for your next luxury horse trailer, remember we’ve been manufacturing new horse trailers for decades. When we talk about the Trails West Difference, what we really mean is our horse trailers, living quarter trailers and stock trailers are all made with the highest-quality materials in the industry by people who love horses and the great outdoors just as much as you. We’ve spent decades revolutionizing the trailer-building process, allowing us to offer a superior quality horse trailer at a competitive price. Our hard work and innovation insures our customers are getting the absolute best trailer for their money. 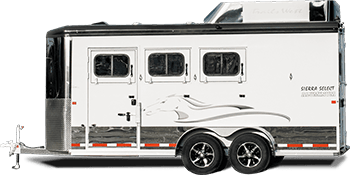 Our primary focus is producing a safe horse trailer with luxury amenities. Trails West builds our horse trailers on solid steel frames encased in aluminum similar to the way aircraft and automobiles are manufactured, with strength and durability as our #1 goal. This hybrid process creates a safer and stronger trailer making it more resilient to the stress and flex naturally caused by travel. Our technique produces a high-quality paint finish on structurally-superior horse trailers for less cost than aluminum trailers while providing the most value and widest range of options in the industry. Trails West uses electro-galvanized sheet steel or .050 aluminum sheets (depending on model) on the outside of each of our horse trailers. We coat these sheets with automotive primer and .03 mils of polyurethane paint, which produces a high gloss, automotive quality finish. This gives our customers an exterior that matches from sheet-to-sheet and easy maintenance to boot. The trailers are washed easily with soap and water; no need to use cumbersome acid washes. Trails West uses high quality 2”x10” douglas fir lumber for the horse/stock compartment floor. This proven design has remained unchanged for the last 29 years; a testament to its practicality. Our floors are durable, and hold up better to barn-yard chemicals than any other flooring on the market today. We intentionally space each flooring board at a distance that allows them to breathe, preventing the trap moisture. When the floor starts showing signs of wear, it can be completely replaced with inexpensive materials easily found at any hardware store in the country.